StarKid PSD is a Kindergarten and Day Care PSD template for Kindergarten, pre-school,day care services or primary school, montessori schools, etc. ** The WordPress version of This Kindergarten HTML template is available here Kindergarten WordPress theme – StarKid. The theme comes with 3 modern and elegant, highly customizable kindergarten & pre-school premade demos. The demos are amazingly gorgeous with tons of beautiful UI elements that could serve many purposes. Our designers are creative artists who also are parents and work in the education field so we know what element should and shouldn’t be in a Kindergarten template. 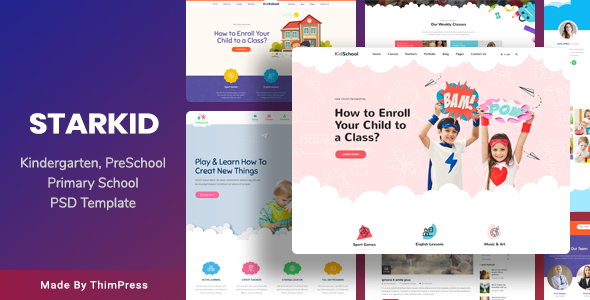 Therefore, if you are out looking for a great Preschool, Primary School, Kindergarten and Day Care template for your website, StarKid is definitely the right choice. NOTE:​ The images are used for the demo purpose only and included in download package.